The studio was filled with the rich smell of roses. Lord Henry Wotton was sitting on the divan and smoking innumerable cigarettes. Through the open door came the distant sounds of the London streets. In the centre of the room stood the full-length portrait of a young man of extraordinary personal beauty, and in front of it, some little distance away, was sitting the artist himself, Basil Hallward. As the painter looked at the gracious form he had so skilfully mirrored in his art, a smile of pleasure passed across his face. He suddenly started up, and closing his eyes, placed his fingers upon the lids. A portrait like this would set you far above all the young men in England. — Этот портрет вознёс бы тебя много выше всех молодых художников Англии. I have put too much of myself into it. — Я вложил в него слишком много самого себя. “Dorian Gray? Is that his name?” asked Lord Henry walking across the room towards Basil Hallward. “Summer days are long, Basil,” said Lord Henry in a quiet voice. “Perhaps you will get bored before he will. Intelligence lives longer than beauty. One day you will look at your friend and you won’t like his colour or something. “Where was it?” asked Hallward with a slight frown. 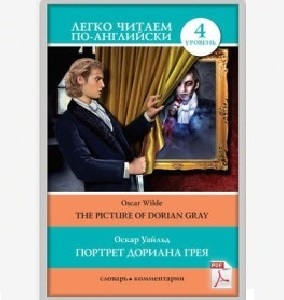 This entry was posted in Oscar Wilde / Оскар Уайльд, Книги для среднего уровня (intermediate).